This update includes the new character with animations, new buildings and future ones, inventory progress with more functionality, and more terrain assets(vegetation). The new character now has all animations set, ready to be implemented into the game.The new animations are: Run animation, run with small weapon, run with rifle, crouch run, crouch run with small weapon rifle,prone movement(run), prone with small weapon/rifle, eat/drink animations, and the list goes on !A challenge with Unity is the animation system, the animation system is called "Mechanim", and has sometimes trouble playing the right animation at the right time.But I will try getting the character animations to run correctly.Below this text, there are a few .gifs showcasing some simple character animations, I will fix the bones glitching out at some points. Added more inventory functionality, such as using usable items, and drinking/eating water/food.Equipable items are equipable directly from the inventory screen, by right-clicking on the equipable item. Next week, I will bring weapon/cloth functionality to the inventory screen, so each and every part of cloth on your character is customizable and changeable.Same goes with the weapons, they will in the future have attachments, I have not decided yet what kind of attachments. When the inventory is complete, you will be able to drag- and drop items to weapon/armor slots, you can of course right click the item to equip it, if you think dragging and dropping is a pain.Another functionality this week with the inventory, is the bullet count on weapons you use. Bullets and other small items are stacked in your inventory. 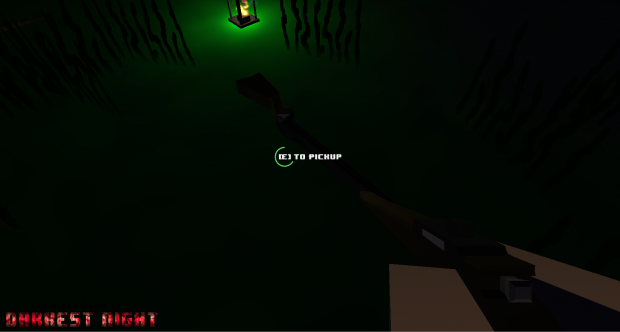 To link the stack to your weapon, so your weapon uses the correct ammunition, you can either drag- and drop or right click on the stack, it can't get any simpler !I've also added a pick up delay when picking up items, it's around 0.5-1.5 seconds for picking up an item, and is represented with a round shape and a tween animation.Why did I add a delay ? Looting is a crucial part of survival games, this delay makes the game a little more realistic.And I won't add any outline around the items, the items should be hard to find and it should be a challenge getting good gear. This week I've started to model terrain assets. 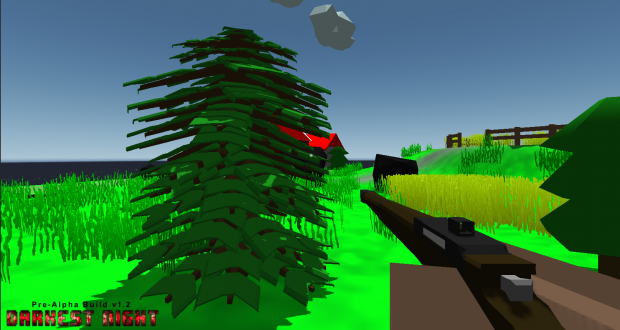 Such as pine trees, bushes, and more rocks.The pine trees, believe it or not, are a important part in a survival game. I don't want players to only camp in a tree all day, so I made the pine tree with semi-transparency, so you still can see through it.The pine tree is of course a good spot to camp, but you can still see through the tree. The bushes, are not as important as the pine trees, since they're just "terain fillers", and they make the terrain feel more alive.I will continue creating different variations of vegetations, since it's important to have terrain assets to create a good looking environment. If you would like to try the game, a open beta will soon be available. Thanks for checking out Darkest Night ! still looks like unturned to me, but in civil war? 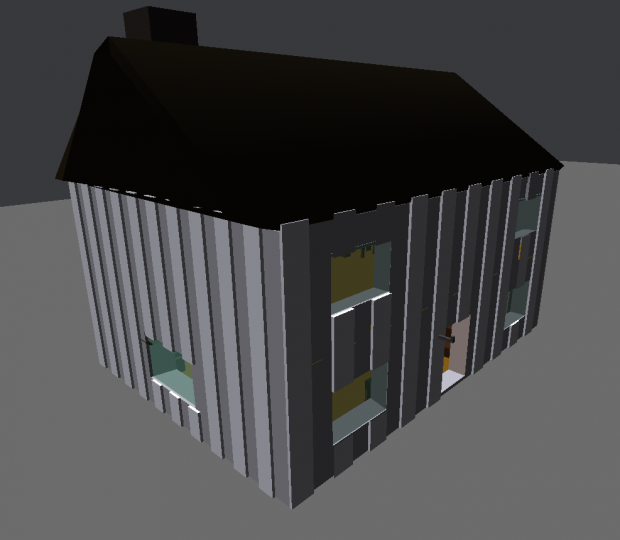 The art style is still low-poly like Unturned. 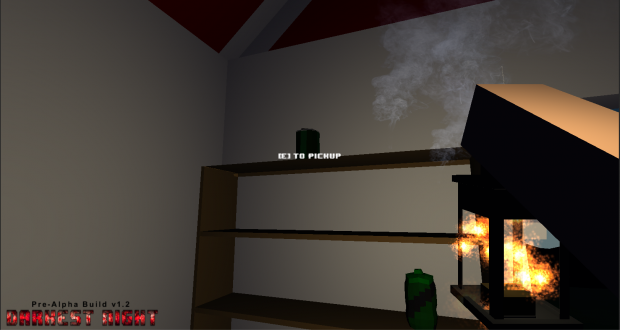 However, if you look at the character, it does differ from Unturned and other low-poly titles. I think my game looks more like Stranded 2, but I'm currently working on improving the terrain and replacing current placeholders. Keep an eye on the future updates, graphic updates will come, but they're not my biggest priority right now. I would really like it if you were a part of the open beta. Stay tuned for updates regarding the open beta, and when it's time I can also send you a private message here on IndieDB regarding the open beta.